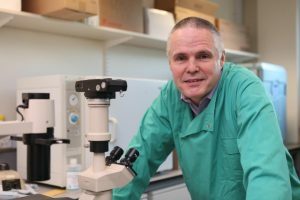 Scientists at the University of Bradford, and the University of Surrey, in the U.K. have shown how prostate cancer cells release a protein that is taken up by surrounding normal and cancer cells, and which may promote tumor growth and help protect the cancer from the body’s immune system. Of potential clinical relevance, the concentration of EN2 protein in the urine of both prostate cancer and bladder cancer patients has been linked with tumor size and grade, and so may have diagnostic and prognostic value. However, scientists have until now known very little about the molecular mechanisms that underpin EN2 activity, and are unclear about whether the protein is present in cell membranes, or whether it is secreted or taken up by cells using active mechanisms. To try and expand on existing knowledge the researchers tagged the EN2 protein using fluorescent markers and tracked its activity in human prostate cancer cells, normal prostate cells, and in bladder cancer, melanoma and leukemia cells. The team’s results, more surprisingly, showed that EN2 isn’t just ejected in microvesicles by the prostate cancer cells, but is also inserted in the cell membranes, with part of the protein remaining accessible at the cell surface. This may provide opportunities to block the protein’s normal activity as a potential anticancer strategy. “In addition to secretory vesicles, EN2 protein is present in the plasma membrane of cells, and although further work is needed to understand the exact mechanism of insertion and its relationship with the phospholipid bilayer, our findings indicate that part of the EN2 protein is exposed on the outside of the cell, and hence could potentially act as a target in antibody-directed therapy,” the authors noted. Next articleAspirin a Day Keeps Tuberculosis Away?